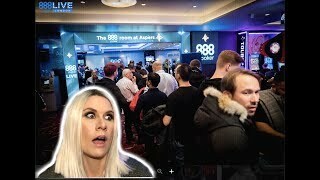 Sarah Herring talks to Head of Poker at Aspers Casino John Scanlon to get his thoughts on the massive increase in field size year on year. During Day 1 players were lined up into the Casino to get a seat, but there just weren’t enough tables! Poker is alive and well in the UK and Scanlon explains changes are already in the works so the next event can accommodate even more players!